Most people know the name St. Bernard for the dog that was bred to rescue people in the Alps, which are in turn named for Saint Bernard of Menthon by way of Great St. Bernard Pass in Switzerland. 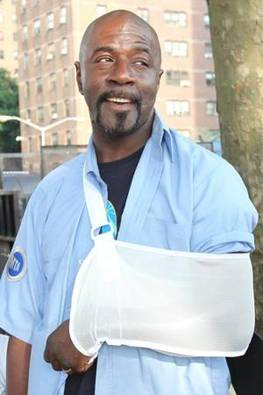 This week in New York a man named St. Bernard is being hailed as a true savior and hero - a saint - after catching a girl that fell form a third story window. Stephen St. Bernard, bus driver and father of four, noticed a 7-year-old girl three stories up dancing on an air conditioning unit outside a Brooklyn building. Realizing this was a recipe for disaster and thinking what if that was one of his children, St. Bernard went up to the building below the girl. He swayed with her every move on the air conditioner so he matched her movement and when she sure enough fell, he was right there to catch her. Vidoe of the incident including the girl dancign and St. Bernard catching her can be see here. He suffered a torn tendon in his bicep while the girl received only minor injuries, far less than if she had fallen straight to the ground. St. Bernard's perception and initiative to go over and help the girl are - well - saintly. The kicker is that after his name, his license plates read 'SAINT' - now a badge of honor and title versus just a part of his name.